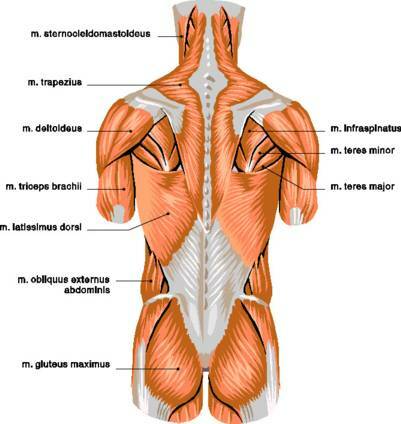 There are many muscles of the back that can be strained through overuse, sport or poor posture. The muscles around the shoulder blades are particulary prone to becoming overused, especially as posture becomes poor and the back rounds. VDU operators and drivers are at risk of muscle strain because of continually holding out their arms out in front of them. Neuromuscular technique is particularly effective at treating tender points in the muscles around the shoulder blade. The vertebrae in the thoracic spine are restricted in their mobility due to the attachment of the ribs. The muscles of the spine often clamp down on the verterbrae and they become locked together either as a pair or a larger block. This leads to pain as the joint surfaces are compressed, the joints become irritated and the lack of movement stops the products of metabolism from being pumped away. The lack of mobility can in turn cause rib dysfunction. Articulation and manipulation to the spine can help restore the mobility and re-educate the muscles to help prevent them clamping down. Pain in the back is also commonly caused by dysfunction of the ribs. See our separate page for this.